Machine Learning, Artificial Intelligence and Natural Language Processing (NLP) are transforming the technological landscape in a wide range of applications. How Machine Learning frameworks have been applied in the real world continues to evolve and affect our daily lives, especially with chat bots. 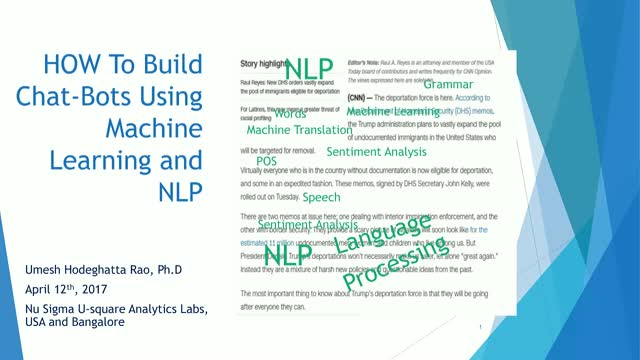 In this session Dr. Hodeghatta Rao will explain the fundamental concepts of Natural Language Processing (NLP), what are the practical applications of NLP, how machine learning is adopted to process the natural language and finally end with an overview of QnA (chat) system.